Print or download and print the following forms to register your Working Australian Kelpies. Individual Dog Registration Application – Applications are reviewed on a case by case basis. All pedigrees are researched regardless if a dog is registered elsewhere. Dogs* with unverifiable purebred ancestry will not be accepted for registration with the Kelpie Registry. 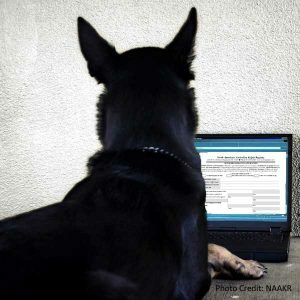 Please note, if you are registering dogs that are not out of NAAKR registered dogs, or dogs registered with another registry/association, you must provide a copy of the registration certificate with registration numbers and a certified pedigree that includes registration names/numbers of at least 6 generations (10 generations preferred) not counting the dog being registered. *Dogs not accepted for registration in the Kelpie Registry may be registered with the with the Working Cow Dog Registry. Litter Registration Application – Breeders may register litter/s. Please note, as with individual applications, litters with sire and/or dam NOT registered with NAAKR, but registered with another registry/association, must be accompanied by a copy of the registration certificate with registration numbers and a certified pedigree that includes registration names/numbers of at least 6 generations (10 generations preferred) not counting the dog being registered. All pedigrees are researched regardless if a dog is registered elsewhere. Dogs with unverifiable purebred ancestry will not be accepted for registration with the Kelpie Registry. Kennel Prefix and/or Tattoo Registration Application – Individual may register their kennel prefix and/or tattoo. Registry Female Breeding Lease Agreement – This form must be filed with the Registry before any litters, etc., will be registered under a prefix other than the recorded owner. Affidavit for Lost Certificate – This affidavit must be completed by the recorded owner of the dog, notarized and accompanied by replace fee to secure a replacement certificate if the orignal certificate has been lost, stolen or destroyed. Breeder Listing – Breeders who register dogs regularly with NAAKR may submit for annual online breeder listings. Annual fee of $35.00. Listings run the calendar year (January through December). Breeders submitting after September 15 for a listing; your listing will be due the following year on December 31. You are responsible for renewing your listing each year. The Registry will not bill you. All NAAKR rules, regulations, policies, procedures, and fees are subject to change without notice. Registry reserves the right to refuse any dog/s for registration, for any reason. All certificates are issued with the right to correct or revoke.